This bird looks and feels like a small passerine. The bill is short and triangular in shape, which indicates that we're looking at a seed-eating passerine. Even though the bird is partially hidden behind a branch we can see that the supercillium (eyebrow) is orange. There aren't too many small passerines with conical bills and orange supercilliums. 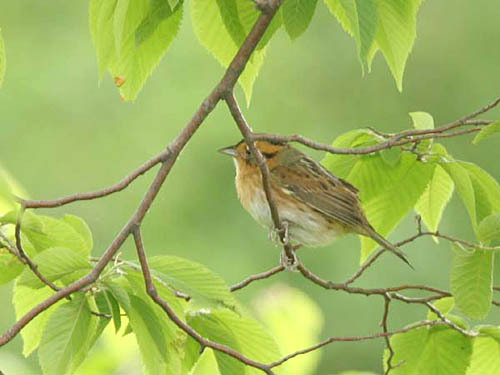 In fact, there are only 2 that occur in Illinois, namely LeConte's and Nelson's Sparrows, both of which are regular migrants through the state.